The comb-overs, massive cleavage, disco-pants and shades boasting around in American Hustle stay true to what 1970s America was all about. The film opens to Christian Bale struggling to put his hair together, glueing a loose hairpiece atop his bald comb-over and adjusting his sunglasses and suit in front of the mirror. Perhaps you can’t always believe what meets the eye. When I first saw director David O. Russell’s dramedy Silver Linings Playbook last year, I was immediately in love. I saw it three times in the theater and pre-ordered the DVD, all because I was in love with his characters and the way he was able to wring out truth and humanity within those broken individuals. 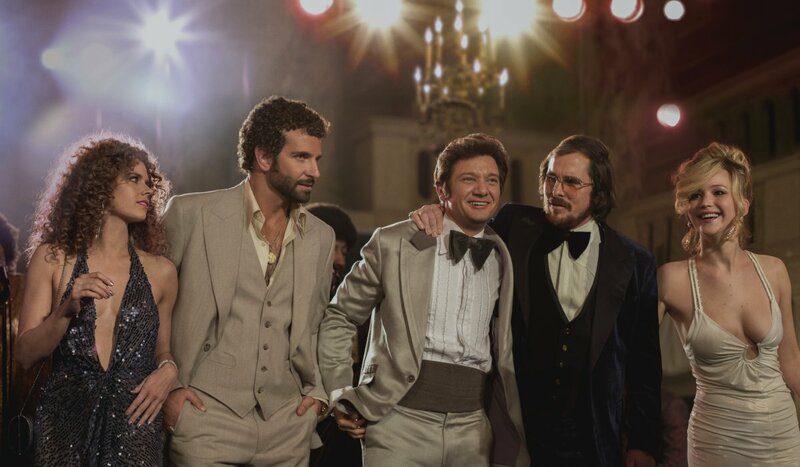 Infamous for his character-development pieces, American Hustle draws a lot of parallels in that we get to know the story better by eying-in on characters and observing their motivations to really see what drives their character, without even really being given a description in the first place. The whole movie becomes a con-game when we are introduced to Irving’s (Bale) partner/girlfriend Sydney (Amy Adams)–who is drop-dead gorgeous–and get wrapped up in their game of hustling. The sweet thing about these two is that, even when FBI agent Richie DiMaso (Bradley Cooper) comes into the picture and has his eyes set on Sydney to con-out some politicians, the hideous Irving and alluring Sydney seem to retain their unbreakable bond–even when Irving’s crazy young wife Rosalyn (Jennifer Lawrence) comes into the picture–which, I might add, is a ballsy role as Jennifer Lawrence lets it rip with her big-mouthed, alarming, thinking she’s brilliant yet still holds a ton of humility role of a young mother who may be talking too much or drinking too much alcohol while singing and dancing around in her New Jersian-accent. She’s a remarkable touch of fun and sass to this film. But, with all the glitz, glam and romance played to Irving and Sydney’s first meeting and falling-in-love over some Duke Ellington, this film’s smart and funny. It takes a lot of paying attention to to understand what exactly is going on within the storyline as this isn’t something you can breezily sit by; but, for something as snarky and dirty as playing with corruption and bribery all with a tune-up of a comb-over, some cleavage and sunglasses, it still is pretty funny. And David O. Russell really does create some magic with the way he is able to bring out the heart to such broken, corrupt, yet seemingly relatable characters.